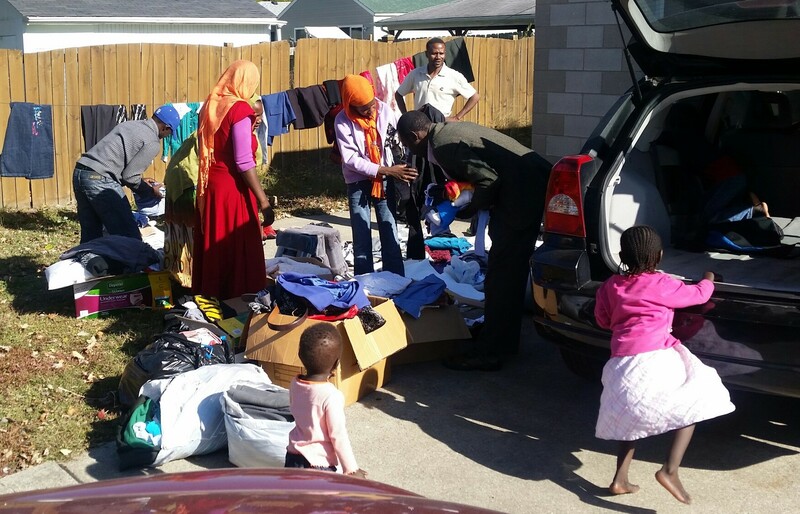 DOHS gave eleven newly-arrived Darfuri refugees about seventy-five percent of its Louisville clothing supply today (Oct. 21, 2015), among them blankets, sweaters and jackets just in time for the cold weather. Khamiss Youssif, DOHS President, is in the very back of the picture (in the tan, short sleaved shirt), looking on as others look over the selection. Our Treasurer Mohammed Abdelrahman has also received clothing donations for DOHS in Dallas, TX. And our members have accumulated still more such donations in Baltimore, MD under the guidance of our Vice-President, Mohammed Adam.